This article is about the artist. For the financier, see Saul Steinberg (business). 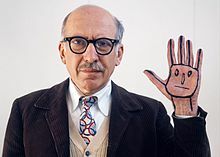 Saul Steinberg (June 15, 1914 – May 12, 1999) was a Romanian and American cartoonist and illustrator, best known for his work for The New Yorker, most notably View of the World from 9th Avenue. He described himself as "a writer who draws". Steinberg was born in Râmnicu Sărat, [[Buzău County], [[Kingdom of Romania|Romania. In 1932, he entered the University of Bucharest. In 1933, he enrolled at the Politecnico di Milano to study architecture; he received his degree in 1940. In 1936, he began contributing cartoons to the humor newspaper Bertoldo. Two years later, the anti-Semitic racial laws promulgated by the Fascist government forced him to start seeking refuge in another country. After World War II, Steinberg continued to publish drawings in The New Yorker and other periodicals, including Fortune, Vogue, Mademoiselle, and Harper’s Bazaar. At the same time, he embarked on an exhibition career in galleries and museums. In 1946, he was included in the critically acclaimed “Fourteen Americans” show at The Museum of Modern Art, New York, exhibiting along with Arshile Gorky, Isamu Noguchi, and Robert Motherwell, among others. Steinberg went on to have more than 80 one-artist shows in galleries and museums throughout the US, Europe, and South America. He was affiliated with the Betty Parsons and Sidney Janis galleries in New York and the Galerie Maeght in Paris. Since 1982, he has been represented by The Pace Gallery. A dozen museums and institutions have in-depth collections of his work, and examples are included in the holdings of more than eighty other public collections. After Steinberg's death on May 12, 1999, The Saul Steinberg Foundation was established in accordance with the artist's will. The Foundation’s mission is "to facilitate the study and appreciation of Saul Steinberg's contribution to 20th-century art" and to "serve as a resource for the international curatorial-scholarly community as well as the general public". Full details of Steinberg’s life and career are presented on the website of The Saul Steinberg Foundation. The Saul Steinberg Foundation website, “Selected Bibliography." Joel Smith, with an introduction by Ian Frazier, Steinberg at The New Yorker. New York: Harry N. Abrams, 2005. Iain Topliss, The Comic Worlds of Peter Arno, William Steig, Charles Addams, and Saul Steinberg. Baltimore: The Johns Hopkins University Press, 2005. Joel Smith, with an introduction by Charles Simic, Saul Steinberg: Illuminations. New Haven and London: Yale University Press, 2006. Saul Steinberg: L’Écriture visuelle. Strasbourg: Musée Tomi Ungerer, 2009. Mario Tedeschini Lalli, “Descent from Paradise: Saul Steinberg’s Italian Years, 1933-1941.” Published in Issues in Contemporary Jewish History, no. 2, October 2011. ^ Nicholas Garland (2 December 2008). "Saul Steinberg: Illuminations at the Dulwich Picture Gallery". The Telegraph.